Burton Island (AG-88) was launched 30 April 1946 by Western Pipe and Steel Co., San Pedro, Calif., and commissioned 28 December 1946, Commander G. Ketchum in command. After receiving supplies Burton Island departed San Diego 17 January 1947 and steamed to the Ross Sea, Antarctica, where she arrived 8 February for rendezvous with units of TF 68 on the First (1947) Antarctic Development Project. She made her way through the ice packs to the Bay of Whales and unloaded supplies and received passengers for the return voyage. She arrived at San Pedro 31 March 1947 after steaming via Port Chalmers and Wellington, New Zealand; and Pago Pago, Somoa. After undergoing a yard overhaul she picked up supplies at San Francisco and Seattle and departed 25 July for the 1947 Point Barrow Expedition. At Point Barrow, Alaska, Burton Island's helicopters participated in ice reconnaissance and surveys. She returned to San Diego 24 August. Burton Island underwent overhaul and repairs at San Pedro and then joined the Second (1947) Antarctic Development Project. She arrived 1 January 1948 at Shackleton Ice Shelf and conducted hydrographic and geological surveys, ice reconnaissance, and demolition experiments in the area. She returned to San Pedro 31 March and underwent ice damage repairs at Long Beach. Between April 1948 and December 1956 Burton Island participated in 19 different type cruises in Arctic and Alaskan waters. Each time she returned to the west coast she received overhaul or repairs at either Long Beach, Mare Island, or Bremerton Naval Shipyards, then resumed her duties on the expeditions. Duties performed included: supply activities; helicopter reconnaissance of ice flows and packs; ice surveys and photographs; oceanographic, hydrographic, geological, coast and geodetic, and hydrophone surveys; electronic interference surveys; underwater demolition team explosions in ice packs; and Arctic convoy exercises. Expeditions in which Burton Island took part were Point Barrow Resupply Expeditions (1948-51), MICOWEX-50 A; Beaufort Sea Oceanographic Expeditions; Bering Sea Explorations; MSTS Project 572; and several expeditions into the Bering and Beaufort Seas as far north as the Arctic Circle and the Canadian Northwest Territories near the Mackenzie river. During March 1949 while undergoing repairs at Lon Beach, Burton Island was designated AGB-1. 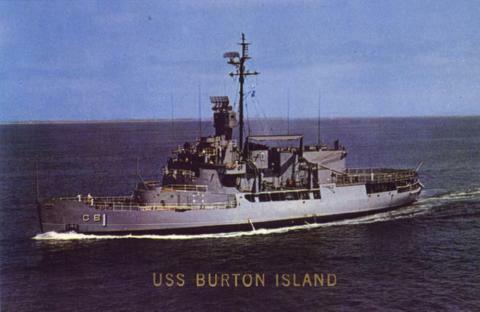 On 15 December 1966 Burton Island was decommissioned and transferred to the U. S. Coast Guard. The Coast Guard operated the ship until 1978 when she was decomissioned and disposed of as excess property.